It's a major new piece of city development, and it's been coming under fire from Rob Ford and others. But what exactly is it all about? A rendering of the Eglinton Connects design vision. Courtesy of the City of Toronto. On May 6, city council adopted three reports by Eglinton Connects—setting in motion a plan to overhaul Eglinton Avenue, from Jane Street to Kennedy Road, in conjunction with the development of the Crosstown Light Rail Transit line. Last week, as council considered some amendments to the plan, critics—Mayor Rob Ford among them—took the opportunity to voice concerns with the project. But what precisely is Eglinton Connects? And are its detractors right to worry about what it will do to the avenue? 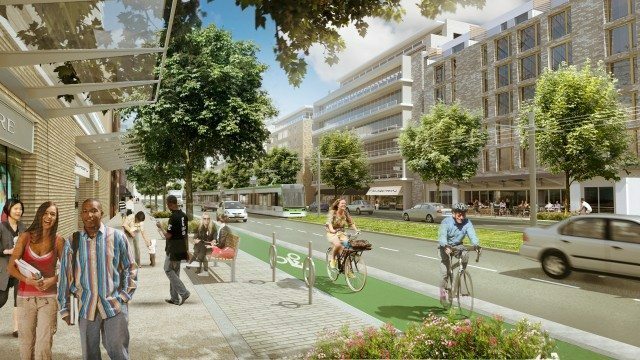 Eglinton Connects is a City of Toronto Planning Study that, for two years, has been evaluating the possibility of revitalizing a 19-kilometre corridor of Eglinton Avenue. The three reports approved back in May consisted of an Environmental Assessment [PDF] that covers recommended improvements to the Eglinton Avenue streetscape; the “Public Realm Amount” report, which proposes that funds be sought from Metrolinx to enhance public space along its rapid transit lines; and the planning study, which includes 21 recommendations [PDF] grouped according to travel, greening, and building that would contribute to Eglinton’s holistic, long-term development. The plans involve creating 38 kilometres of separated bike lanes along Eglinton and 20 hectares of new parks and open spaces, planting 1,150 trees, connecting Eglinton to trails and ravine systems in the Humber and Don River valleys, widening sidewalks, and creating or expanding laneways to improve access to local retail and alleviate street traffic and parking space needs. Rendering courtesy of the City of Toronto. Work is expected to take place in phases, from 2025 to 2050. Though the initial cost estimate for streetscape updates is $150 million, it’s too early to attach a definitive price to the broad, long-term plans, says Edna Cuvin of the project’s planning team. The Eglinton Connects plan hasn’t been popular with everybody. Mayor Ford told council on July 11 that the changes to the avenue were just another campaign in the war on the car, and would result in major traffic jams. The Avenue Road–Eglinton Community Association has warned its members that the plan could result in their neighbour’s house being bought by developers and turned into a parking lot or laneway [PDF]. And other local residents have worried that the laneways running behind their houses might become busy thoroughfares. The gist? Most of Eglinton, save for a 1.5-kilometre stretch, will be four lanes wide. Laneways will be used for local access only, and not intended to handle high volumes of traffic. And, with the exception of the rezoning of two properties, houses in the area are not in danger of being torn down to make way for new development or laneways. Residents might also be reassured to know that the process remains ongoing. “There’s a lot of misconception out there that everything has been decided,” says Cuvin. But in fact, Eglinton Connects is still in its early stages. Much more consulting of locals and city councillors is yet to come, as are more opportunities for the public to have input on the revitalization of this community. CORRECTION: July 17, 2014, 2:30 PM This post originally stated that on July 11, council considered zoning amendments [PDF] related to Eglinton Connects. In fact, those zoning amendments will considered by the planning and growth management committee on August 7.